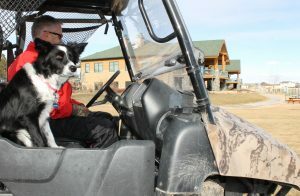 Pepper is the newest employee at Windsor’s Pelican Lakes Golf Club. Pepper has never swung a golf club, nor has she replaced a divot. When she observes your golf swing, she’s unaware if you’re swinging it on the appropriate plane. She also doesn’t know anything about chinch bugs or manganese. She may be the only golf course employee who is a professional in something other than the sport of golf. Pepper is highly proficient in G, but not the G you’re thinking about. The G she’s skilled at is Geese – Pepper is a trained goose chaser. What Pepper lacks in golf ability and knowledge, she makes up for in cunning, intimidation, stealth and speed. 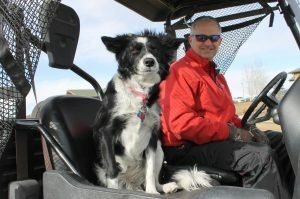 Pepper is a three-year-old Border Collie from Utah. She was initially trained as a ranch dog, but ultimately found her calling being a goose’s worst nightmare. The friendly black and white goose stalker might be intimidating to water fowl, but she’s a sweetheart to Pelican Lakes visitors. Several times a day, every day, Pepper sits shotgun in a cart with a golf course employee as they traverse the paths on our 27 holes. She only exits the cart when geese do not vacate the turf, and that’s when her hunting skills fully kick in. When she’s not goose chasing, Pepper is usually found behind the pro shop counter curled up in a ball, or begging to be pet. The next time you’re in the pro shop, welcome Pepper to the family. She’s by far our friendliest employee.